Today's APOD is an Extra Detail Magnification ("EDM") obtained from yesterday's simply wonderful Contexual VIS image, taken by the NASA - Mars Odyssey Orbiter on January, 21st, 2016, and during its 62.563rd orbit around the Red Planet, where we were able to see a small portion of the Martian Outflow Channel System known as Kasei Valles. This Channel System is approx. 1780 Km long and it was so named after the word "Mars", as pronounced in Japanese Language. This Kasei Valles Channel System can reach a width of even about 300 miles in some places (consider, in contrast and just to get an idea of these dimensions, that the Kasei Valles Channel System is much wider than the Earth's Grand Canyon, getting to be in some places approx. 500 Km - such as about 300 miles - wide, while the Grand Canyon's maximum width is only approx. 30 Km - or about 18 miles). As a matter of fact, Kasei is one of the longest continuous Outflow Channels of Mars; the System begins in the Region of Echus Chasma, then it runs Northward, and, in the end, it appears to empty into the Basin of Chryse Planitia. At about 20� North Latitude, the System splits into two Channels, called Kasei Vallis Canyon and North Kasei Channel, but these two branches recombine around 63� West Longitude. In addition to the above, it has to be said that, in some parts, the Kasei Valles Channel System can reach a depth of even 2 or 3 Km. The Northern Channel Rim visible here, right at the top of the image, shows a complex series of Geological Processes. The medium-sized Unnamed Impact Crater (at the center of the frame) was - most likely - the source of the wonderful (and, probably, fallen down VERY fast!) Landslide that we can see on the lower portion of the picture - and whose origin could have either been an emplacement of Ejecta, or a consequence of the Collapse of the Rim iteslf (Gravity Wasting, maybe?). Furthermore, to the right (Dx) of the aforementioned Unnamed Impact Crater there is a semi-circular Surface Feature that appears to have collapsed as well, and thus created a few medium-sized Rocky Blocks. 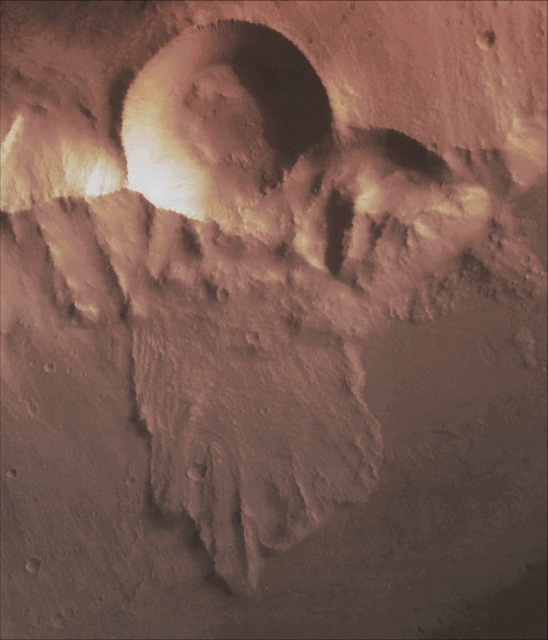 This image (which is a crop obtained from an Original Mars Odyssey Orbiter b/w and Map Projected frame published on the NASA - Planetary Photojournal with the ID n. PIA 20446) has been additionally processed, magnified to aid the visibility of the details, extra-contrast enhanced and sharpened, Gamma corrected and then colorized in Absolute Natural Colors (such as the colors that a normal human eye would actually perceive if someone were onboard the NASA - Mars Odyssey Orbiter and then looked down, towards the Surface of Mars), by using an original technique created - and, in time, dramatically improved - by the Lunar Explorer Italia Team.